Adding to the long list of projects that Mark Walhberg is currently attached to, the Fighter star is set to produce and possibly star in two more films. Variety reports that the actor and his producing partner, Stephen Levinson, have come aboard the adaptation of Robert Cooley’s When Corruption Was King as producers with the possibility that Wahlberg might star in the flick as well. Frank Baldwin is writing the script, with no director attached at the moment. Cooley’s memoir tells the story of how he, as a mob attorney, played a major role in bringing down Chicago’s mob organization during Operation Gambat. Additionally, The Tracking Board (via /Film) reports that Wahlberg is also set to produce and possibly star in a remake of the 1971 action film Billy Jack. Starring Tom Laughlin, Billy Jack centers on a gunslinger who defends a hippie-themed school from townspeople opposed to the counterculture students. Presumably, this plot would be updated. Though I personally think a shoot-em-up action flick with a gun-slinging Mark Wahlberg protecting liberal arts students from angry townsfolk would make for a fantastic moviegoing experience. Hit the jump for a rundown of the other projects that Walhberg is connected to at the moment, as well as a synopsis of When Corruption Was King. Wahlberg is attached to quite a few projects at the moment, some of which have more solid commitments than others. He’s set to produce and possibly star in the action-comedy Bait and Switch, is still hopeful that he’ll star in David O. Russell’s Uncharted, and has been mentioned in connection with another possible Russell project, Cocaine Cowboys. There’s also that “may or may not happen” sequel to The Fighter. The actor is next set to star in Seth McFarlane’s Ted, which starts shooting next month, after he wraps filming on Contraband. 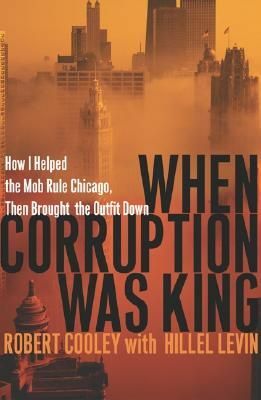 In this true-crime memoir, former Chicago mob attorney Cooley engagingly recounts his role in sparking Operation Gambat, a sweeping federal corruption probe into Chicago’s political and judicial arenas. Operation Gambat succeeded in documenting the extensive ties between the mob and local government, thanks largely to Cooley’s cooperation and courage. The author doesn’t spare himself in recounting his descent into the world of crime, despite his loving family and policeman father; and his transformation from fixer and operator into avenging angel is plausibly rendered. Cooley does a nice job of taking the reader inside an undercover investigation, with its glitches, ego clashes and inevitable setbacks. Although his extensive involvement in graft makes Cooley less than fully sympathetic, his risk-taking to expose the crooked system goes a long way toward redeeming him [Amazon].